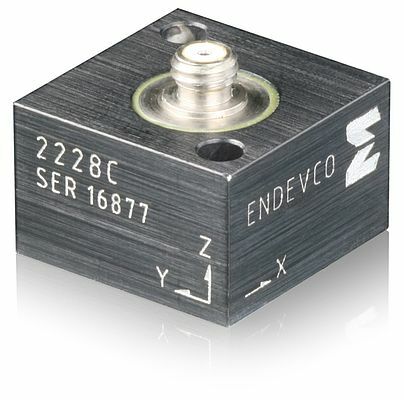 Designed to suit a variety of general vibration testing requirements, Meggitt Sensing Systems’ Endevco model 2228C rugged low-mass triaxial piezoelectric accelerometer features 2.8 pC/g sensitivity. It provides high-reliability vibration measurements on three orthogonal axes with 10-32 receptacles to allow data collection from three separate output connections. These connections also offer a visual reference for the orthogonal axes being measured. With a total package weighing just 15 grams, the accelerometer effectively minimizes mass loading on small structures and objects. Units are designed to reliably operate over a temperature range of -55 to 177˚C, with mounting via two-hole screw or adhesive. The accelerometer is a self-generating device that requires no external power source for operation. Signal ground is isolated from the mounting surface of the unit. Low-noise, flexible coaxial cables are supplied for error-free operation.